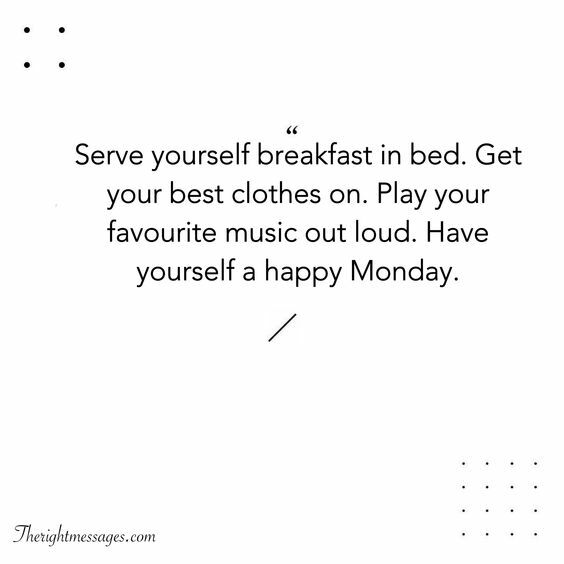 Yes, many of us dread Mondays and if we could skip it, we would. However, till we all master time traveling and some other Harry Potter like moves, we’re stuck with Mondays. Mondays don’t have to give you a miserable feeling about the future. 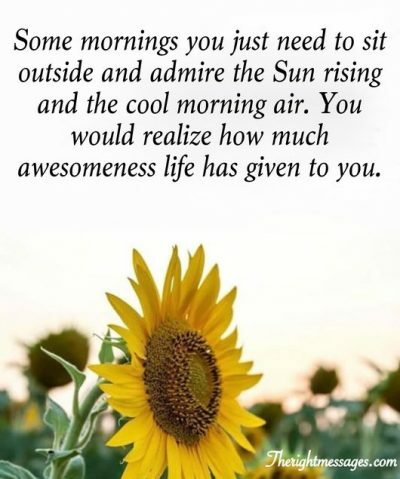 The new week is worth celebrating and you need just the right attitude for this. Let these quotes give you the needed wings and wind to sail through with less stress than before. 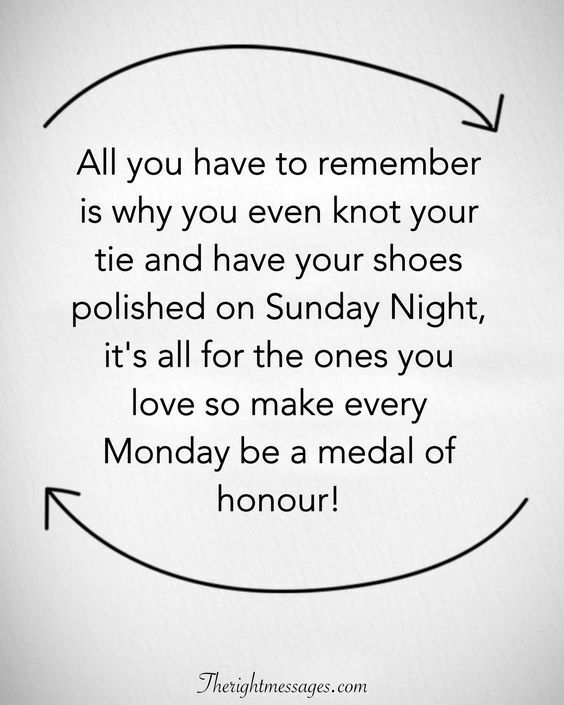 #1: All you have to remember is why you even knot your tie and have your shoes polished on Sunday Night, it’s all for the ones you love so make every Monday be a medal of honour! 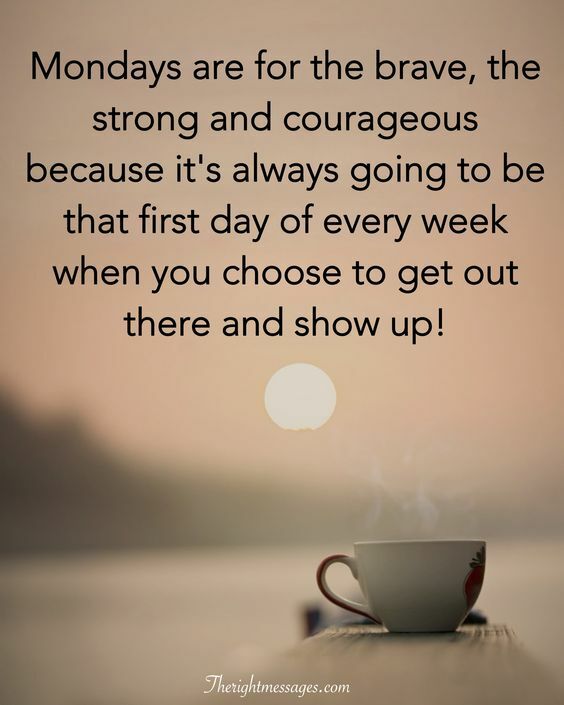 #2: Mondays are for the brave, the strong and courageous because it’s always going to be that first day of every week when you choose to get out there and show up! 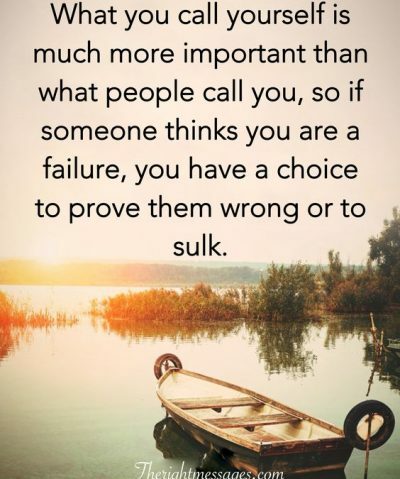 #3: Don’t ever assume you are doing badly because Monday feels so menacing. 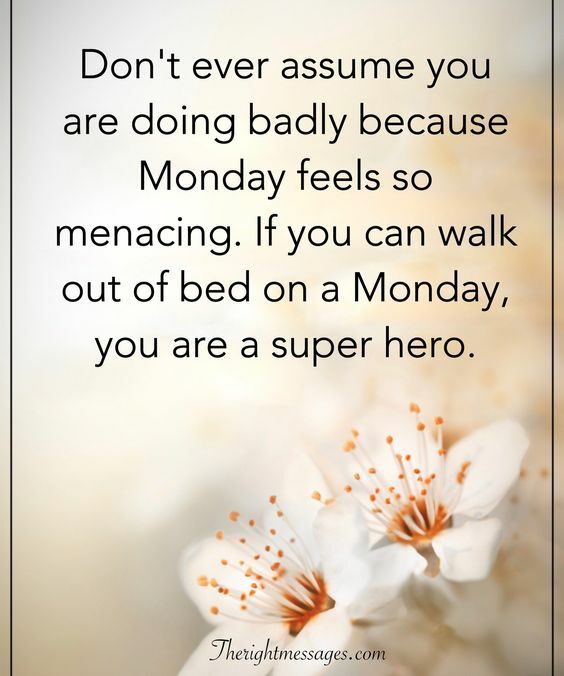 If you can walk out of bed on a Monday, you are a super hero. 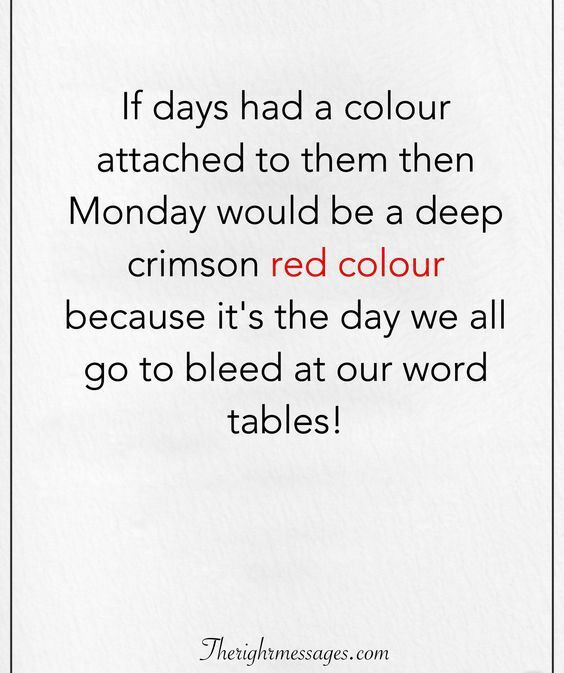 #4: If days had a colour attached to them then Monday would be a deep crimson red colour because it’s the day we all go to bleed at our word tables! 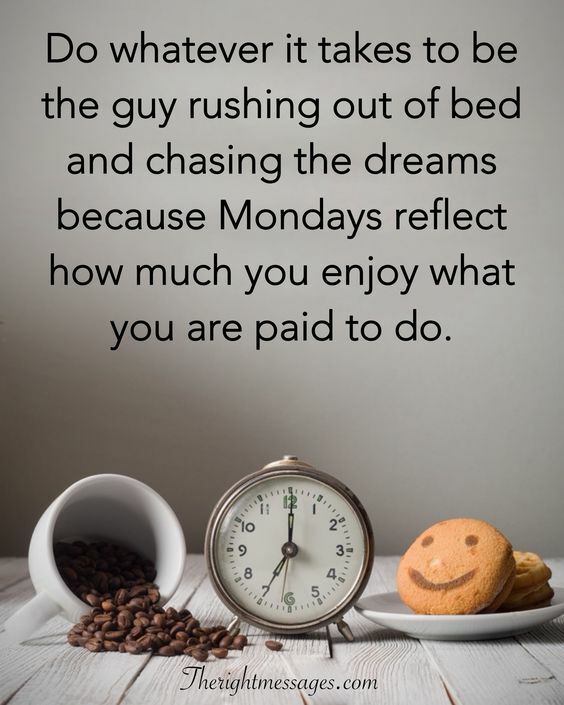 #5: Do whatever it takes to be the guy rushing out of bed and chasing the dreams because Mondays reflect how much you enjoy what you are paid to do. #6: Walk tall on a Monday because you never know what big thing waits for you just outside your door. So walk out into the week with every ounce of pride and preparation. 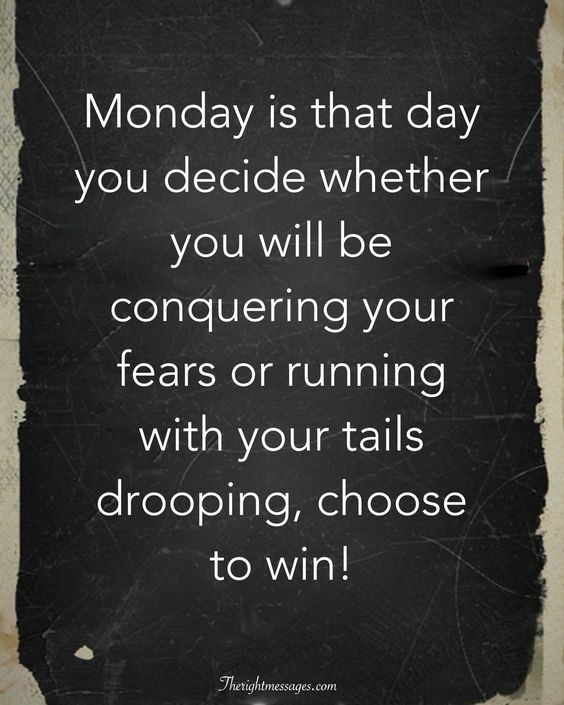 #7: Monday is that day you decide whether you will be conquering your fears or running with your tails drooping, choose to win! 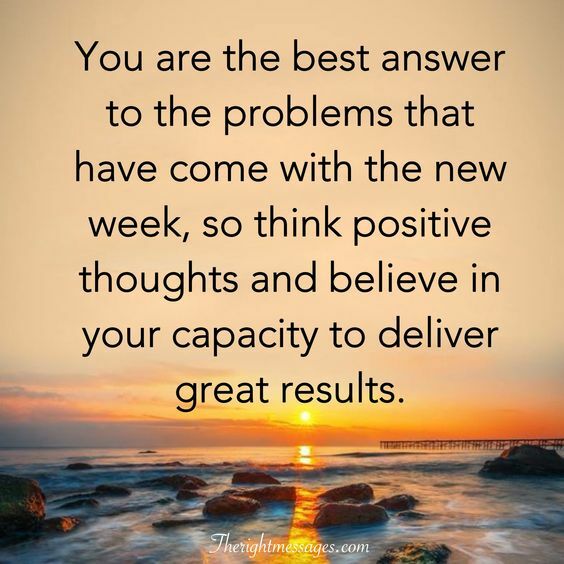 #1: You are the best answer to the problems that have come with the new week, so think positive thoughts and believe in your capacity to deliver great results. 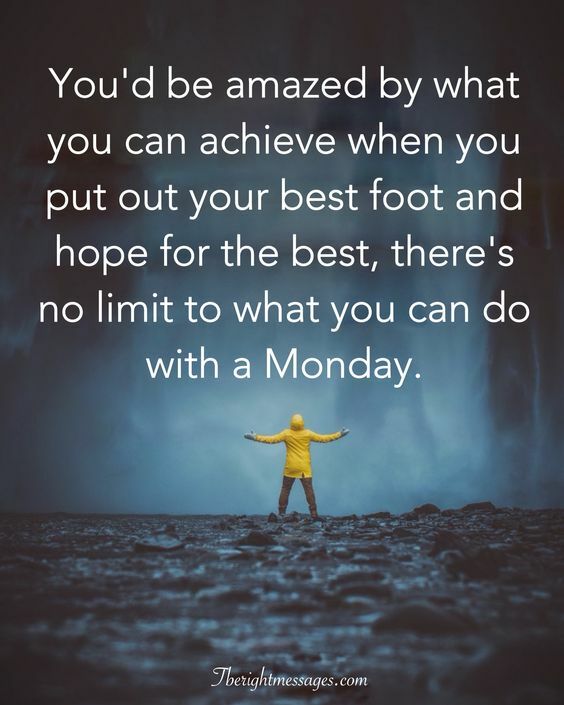 #2: You’d be amazed by what you can achieve when you put out your best foot and hope for the best, there’s no limit to what you can do with a Monday. 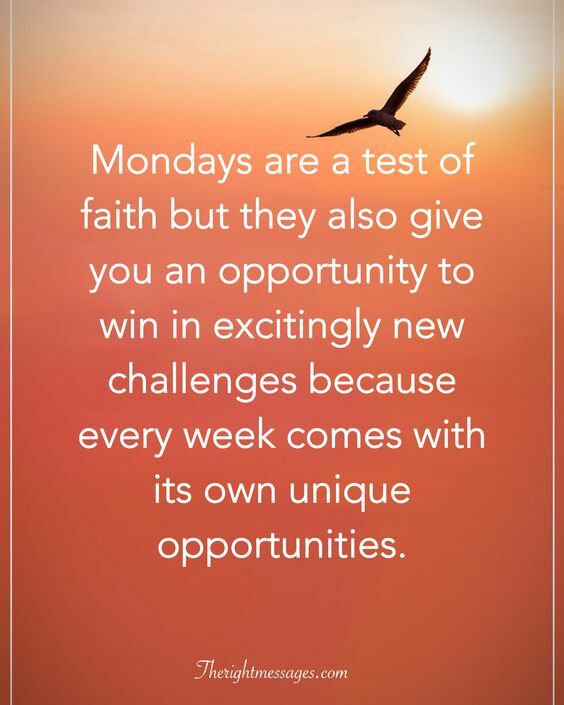 #3: Mondays are a test of faith but they also give you an opportunity to win in excitingly new challenges because every week comes with its own unique opportunities. 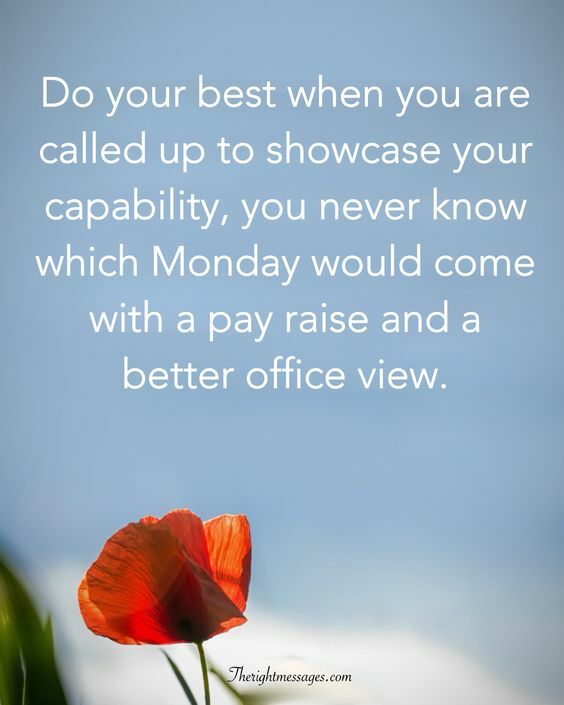 #4: Do your best when you are called up to showcase your capability, you never know which Monday would come with a pay raise and a better office view. 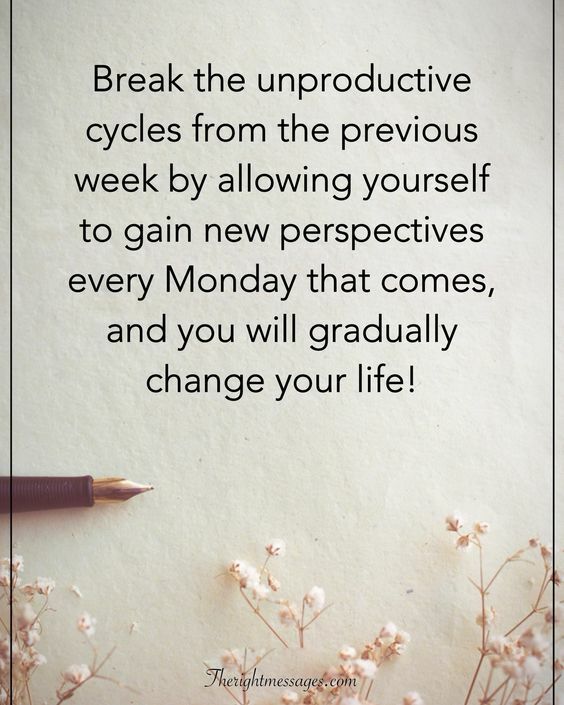 #5: Break the unproductive cycles from the previous week by allowing yourself to gain new perspectives every Monday that comes, and you will gradually change your life! #6: Be the outstanding worker that gives everyone a good reason to show up on Monday, there’s no better way to achieve results than this. 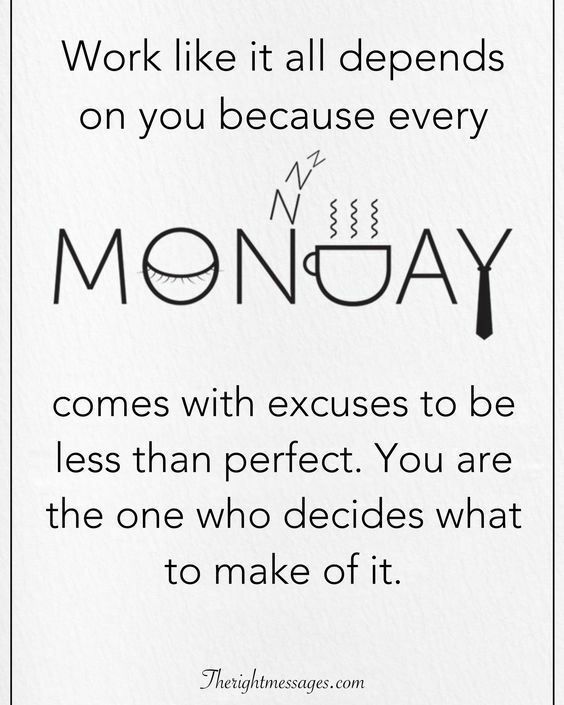 #7: Work like it all depends on you because every Monday comes with excuses to be less than perfect. You are the one who decides what to make of it. 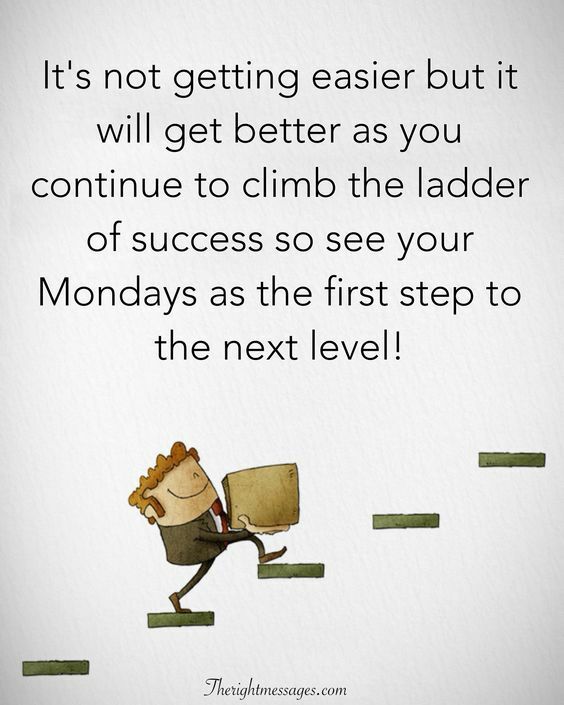 #1: It’s not getting easier but it will get better as you continue to climb the ladder of success so see your Mondays as the first step to the next level! 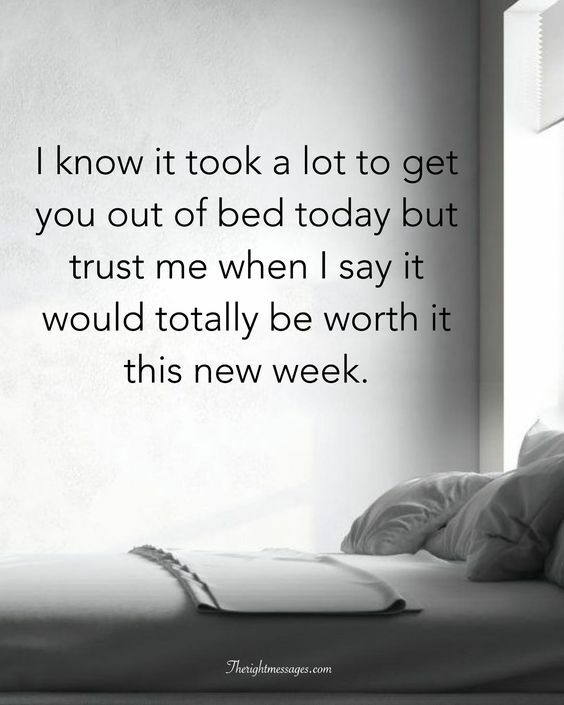 #2: I know it took a lot to get you out of bed today but trust me when I say it would totally be worth it this new week. #3: You can do this! Waltz into Monday like you own the world. And guess what? 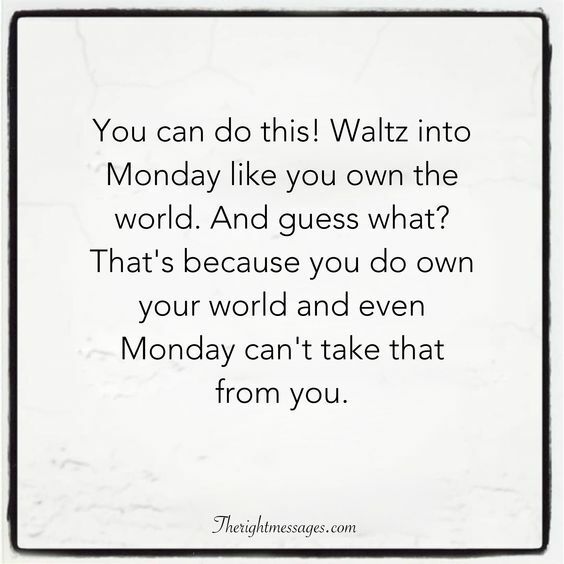 That’s because you do own your world and even Monday can’t take that from you. 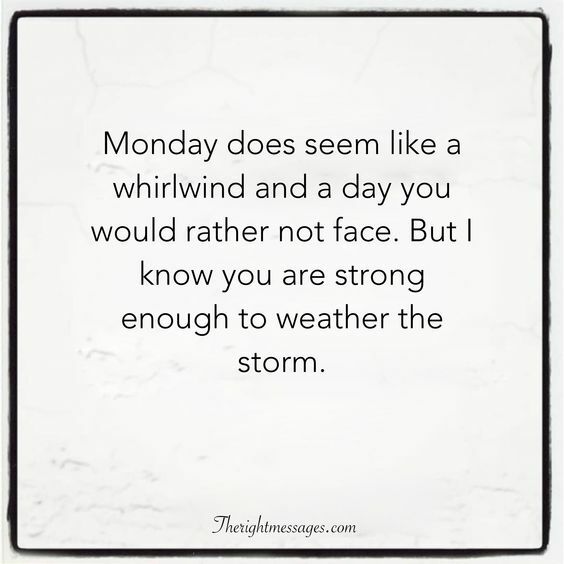 #4: Monday does seem like a whirlwind and a day you would rather not face. But I know you are strong enough to weather the storm. #5: Everyday needs inner strength to see through and for the start of work, Monday demands even more. But, if you can see Monday through, the rest will zip past before you know it. 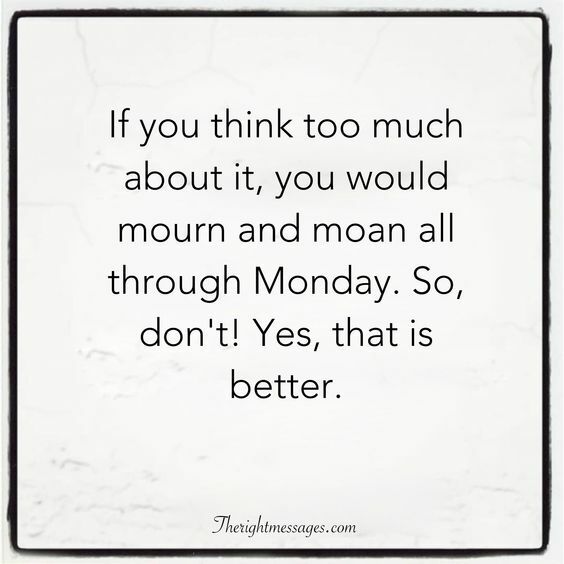 #6: If you think too much about it, you would mourn and moan all through Monday. So, don’t! Yes, that is better. #1: Look at it this way; every week has seven days. DAYS. 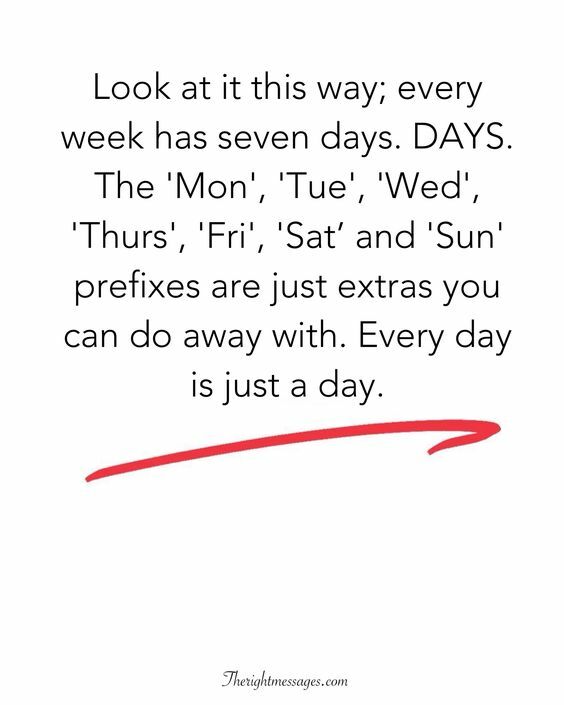 The ‘Mon’, ‘Tue’, ‘Wed’, ‘Thurs’, ‘Fri’, ‘Sat’ and ‘Sun’ prefixes are just extras you can do away with. Every day is just a day. 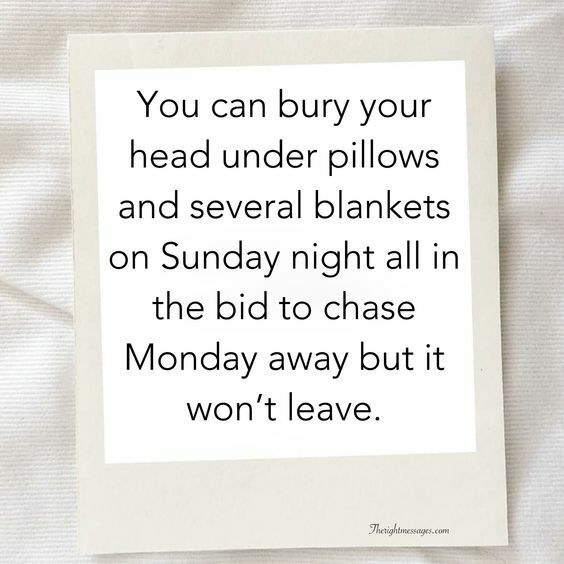 #2: You can bury your head under pillows and several blankets on Sunday night all in the bid to chase Monday away but it won’t leave. 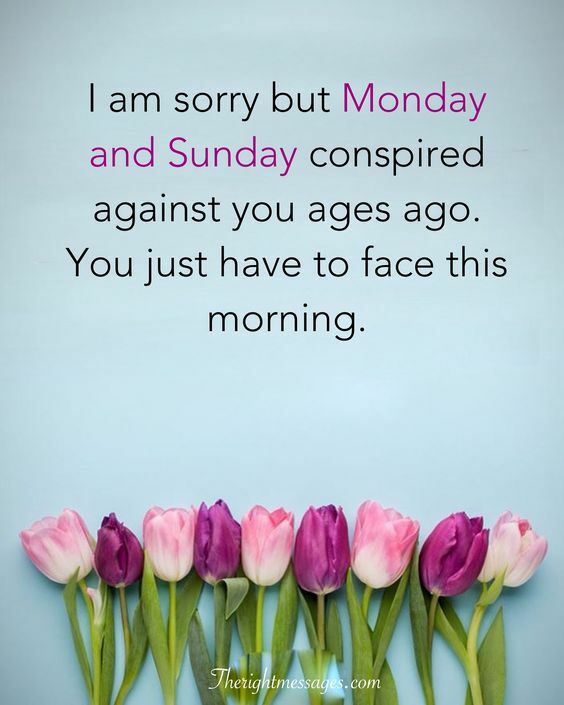 #3: I am sorry but Monday and Sunday conspired against you ages ago. You just have to face this morning. #4: I know Monday seems the worst day of the week. Let me help you; start from Tuesday this time. 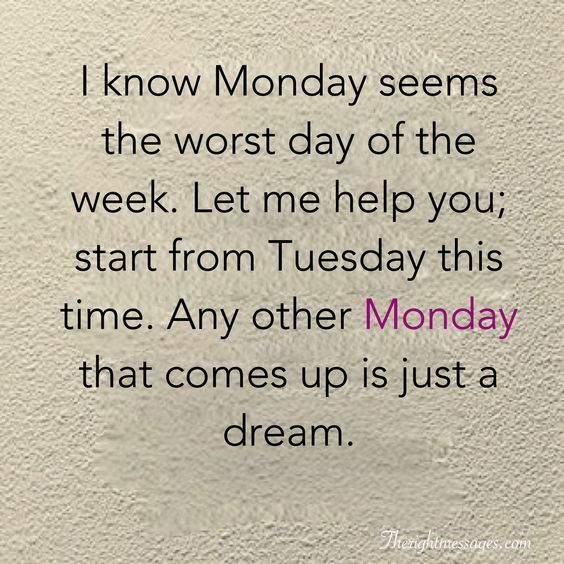 Any other Monday that comes up is just a dream. 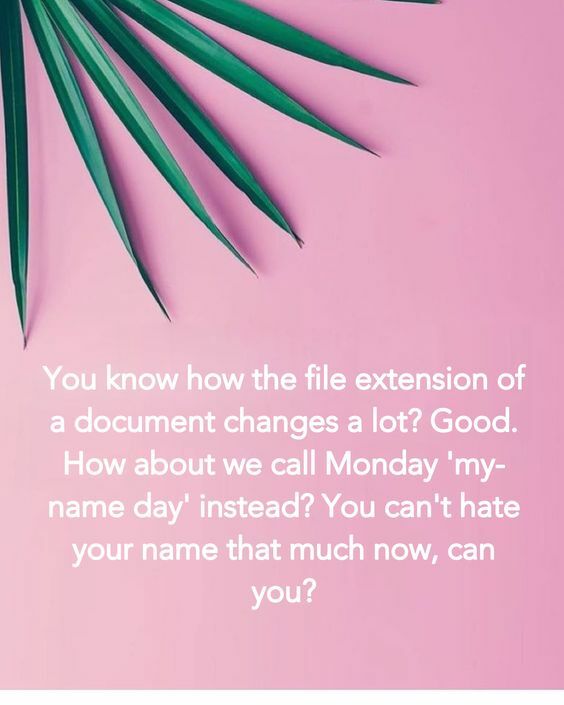 #5: You know how the file extension of a document changes a lot? Good. How about we call Monday ‘my-name day’ instead? You can’t hate your name that much now, can you? 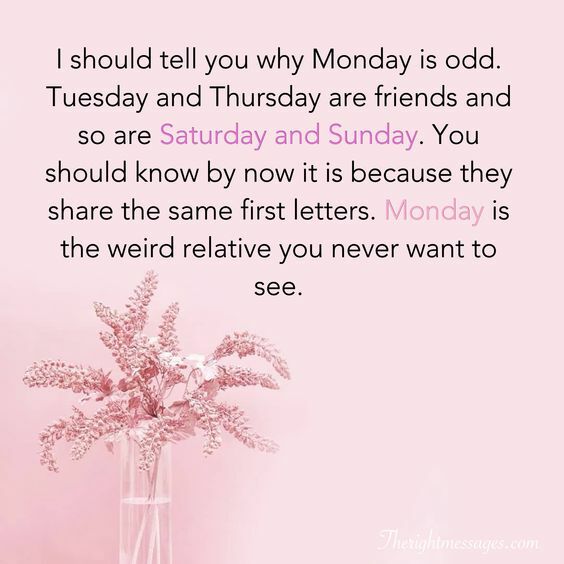 #6: I should tell you why Monday is odd. Tuesday and Thursday are friends and so are Saturday and Sunday. You should know by now it is because they share the same first letters. Monday is the weird relative you never want to see. 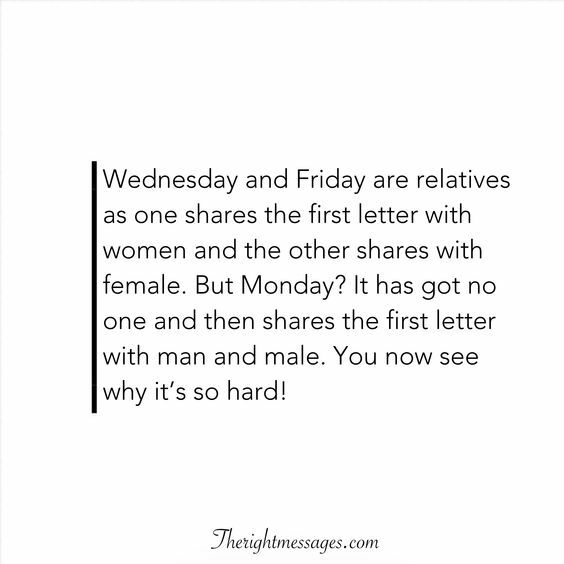 #7: Wednesday and Friday are relatives as one shares the first letter with women and the other shares with female. But Monday? It has got no one and then shares the first letter with man and male. You now see why it’s so hard! 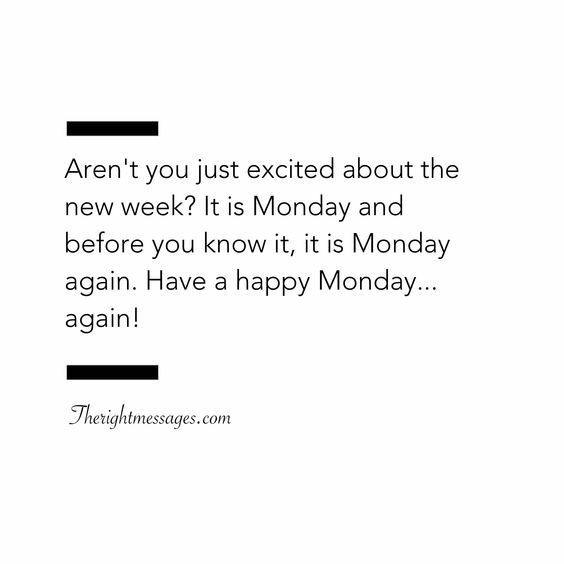 #1: Aren’t you just excited about the new week? It is Monday and before you know it, it is Monday again. Have a happy Monday… again! #2: Serve yourself breakfast in bed. Get your best clothes on. Play your favourite music out loud. 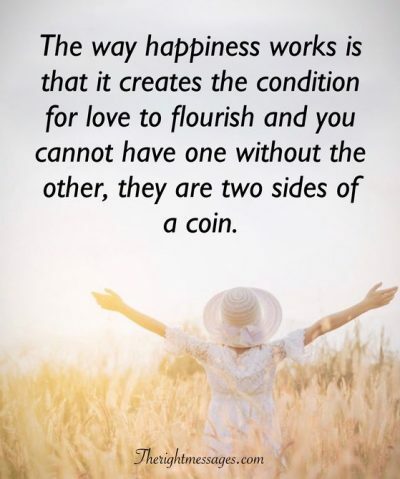 Have yourself a happy Monday. #3: And here we are on another Monday. Another time to hit the ground running. 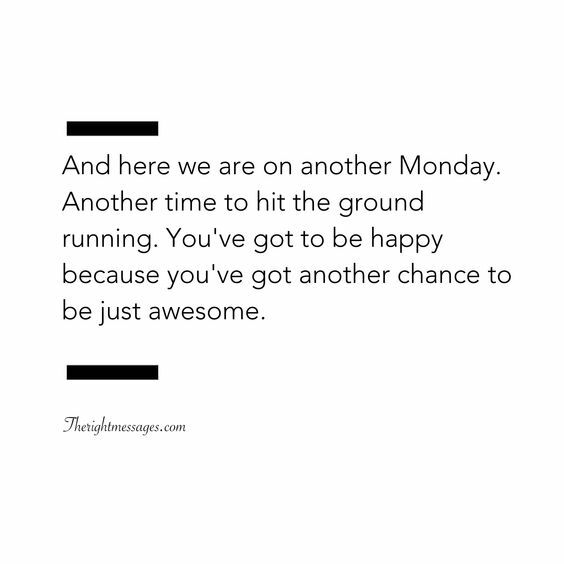 You’ve got to be happy because you’ve got another chance to be just awesome. 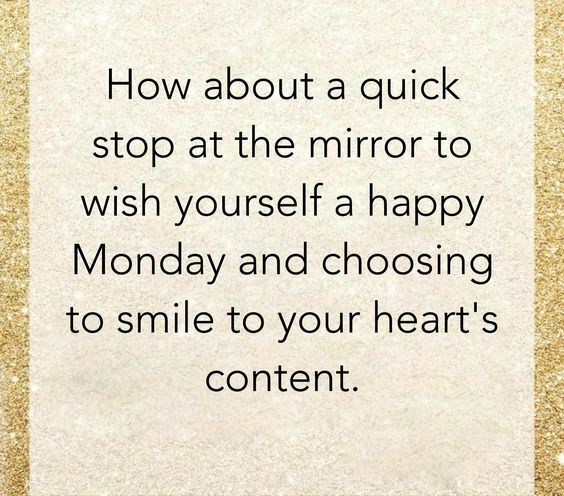 #4: How about a quick stop at the mirror to wish yourself a happy Monday and choosing to smile to your heart’s content. 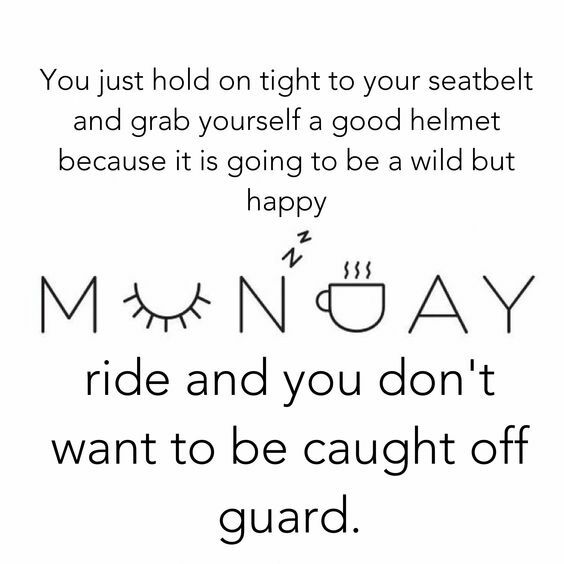 #5: You just hold on tight to your seatbelt and grab yourself a good helmet because it is going to be a wild but happy Monday ride and you don’t want to be caught off guard.